It seems that most people either love numbers or they love words. AJ, my 6th grader loves numbers. She likes to figure things out and solve puzzles, words on the other hand are not her friend. Math makes sense, but vocabulary is difficult for her. If you have read my blog for a while, you probably know how many tears have been shed over vocabulary. We really needed something new! 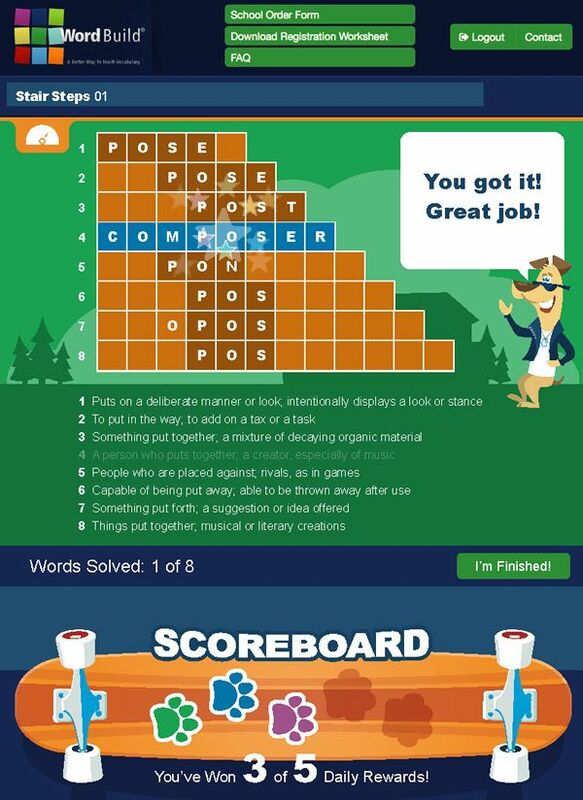 We were recently given the chance to review a neat product from Dynamic Literacy, WordBuildOnline. WordBuildOnline is a vocabulary program unlike anything we have tried before. Instead of studying and learning thousands of different words, the program focuses on learning prefixes, suffixes, and roots. In just 15 minutes a day your student will practice Greek and Latin roots using different game like activities. Since it is online, you will need a good internet connection to use the program. We have used it in both Internet Explorer, and Google Chrome with great results. There are two different levels; Foundations is geared for 2nd through 5th grade and Elements is geared for 6th through 10th grade. We reviewed the Element level. The program will last a school year if students do 1 lesson a day, but the pace can be changed to fit your needs. The site is very easy to use, each day AJ would log into the program and click to start her lesson. Other than making sure she stayed on the site, I didn’t have to do anything! The first lessons were review of prefixes and suffixes. During the review period AJ had to practice working with prefixes and suffixes by finding the meaning to three different words. The activities were quick, but AJ found them a little boring and redundant. I had her do more than the 1 lesson a day so that we could get to the fun part of the program. While she found the first part of the program boring, I found it necessary and a great review. She went into the program knowing some prefixes and suffixes, but she had a lot to learn! I think if there would have been different activities to practice the prefixes and suffixes that AJ would have enjoyed that section a little bit more. Once the prefix and suffix review was over she was able to do her first lesson. The lessons are broken up into 5 days, and last no longer than 15 minutes. There is even a timer that stops the activity when the 15 minutes is up. On the first day of each week AJ watched a video that was less than 5 minutes long. During the video she was introduced to a new root word. She learned different ways that the root could be spelled and the root’s different meanings. After the video she went on to the practice. In the first activity there was a box with 9 squares. The middle box has the root word and the other boxes have prefixes or suffixes. In this activity AJ had to make as many words as she could with the prefixes, suffixes, and root. Once she made each word she had to type in the definition. The first activity was both of our least favorite. It was her least favorite because she had to try and spell all of the words correctly and type a lot of definitions. I liked the fact that she had to think of the different words, but I didn’t like how the activity was scored. It seemed like as long as she spelled the word correctly and typed in some definition that the question was marked correct. When I looked at her progress after the lesson, I could tell that she didn’t really understand the meanings of some of the words, or that she didn’t try. The second day was her favorite activity, the Magic Square. There was a list of 9 different words using the root and 9 different definitions. She had to match them, but there was a fun twist. Each word was assigned a letter and put in a 3 by 3 grid. The definitions were each given a number 1 to 9. She had to make all of the rows and columns add up to the same number. This activity made her think, used math, and helped her use deduction skills even when she wasn’t sure of an answer. The third day was another puzzle, it reminded me of a crossword puzzle. You are given a list of different definitions using the root word, and a set rows of boxes. Each row has the right number of boxes for the word that matched its definition. Some of these puzzles she was able to figure out right away, and others took more time. On the fourth day she was given a set of sentences with words missing and a word bank. She simply had to pick the word that best completed the sentence. The final day of the word study had her take a 10 question quiz on the words that were made by the root word. She earned 100% on each quiz, so I know that she is learning! It has been a LONG time since she had a 100% on a vocabulary quiz! I get an email every time she completes an activity and I can check her progress at any time by logging into my parent account. Aside from the few minor issues mentioned above, the only complaint I have with WordBuildOnline is the 15 minute time limit. I wish there was a pause button on the lessons. A few times she got up to use the bathroom or do something and her session ended without her doing anything. I can go in and reset it in my account, but I wish there was a way to stop the clock if she needs to step away. Days one and three were hard for her, but the rest of the week she really enjoyed. She asks to work on the program and I can see the improvement in spelling and vocabulary. When we are reading I have noticed her trying to pull apart longer words. The prefixes and suffixes that she use to have a problem with are easier for her to figure out and longer words are not as intimidating. The program is solid and I plan to have her continue with it. The best part is that once you purchase it your student can use it until they complete the program even if it takes longer than a year for them to finish. Overall she has learned a lot. The traditional way of memorizing lists of words didn’t work for her, but this does. 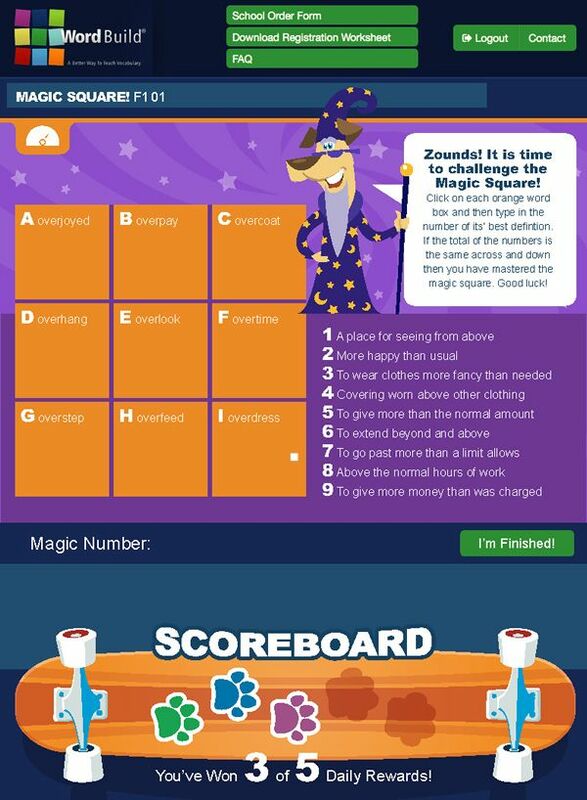 It combines learning vocabulary with puzzles and games and takes the boring out! The computer element made it interactive and fun. If you are interested it trying out this fun vocabulary program, you can use the discount code dailylife for a 25% discount on the book version of the program or 10 % off of the online version.